It was an antidote to one of the most common and dubious ways people think about about bicycling: by dividing the world into “cyclists” and “non-cyclists.” Because of course that’s not how things really work. People are constantly choosing whether to use a bicycle for a trip; the fact that most Americans choose not to isn’t so much about their fundamental nature but about their culture, their resources, and their streets. Geller was just spitballing with the percentages displayed above, but they were more or less validated by subsequent academic research. And though this framework didn’t capture everything — dangerous traffic is far from the only barrier to bicycling — it was a new, deeply useful way of thinking and talking about the ways infrastructure affects our choices. Here at Green Lane Project HQ, Geller’s concept has been a major force behind our work helping cities build protected bike lanes. But like Bob Edmiston of Seattle Neighborhood Greenways, who has created a useful riff on the concept with a character called Wendy (“the willing but wary cyclist”), we think these phrases are sort of a mouthful for people outside the world of bike pros. And we also think they don’t fully capture how much is at stake on our city streets. So we’ve been looking for a new way to capture the concept. This summer, we found it — in a conversation with Geller. In the eight years since Geller’s groundbreaking paper, his own infant daughter has grown up. And it was her he had in mind when he suggested, at a NACTO gathering in Chicago in June, a provocative idea: What if every new bicycle facility were built with the intent of being useful to a young girl? If it were, wouldn’t it be good enough for the rest of us, too? That’s why, at the Pro Walk Pro Bike conference this week, we’re launching a new concept to help guide our work. Isabella (who, just to be clear, is just a character, not Geller’s actual daughter) is 12. She likes cartwheels, Instagram photos with her best friend, and ice cream cones. Sometimes she even likes school. But without someone to drive her around, she can’t enjoy those things, because of the way her neighborhood’s busier streets are built. The ultimate goal of the Green Lane Project — and, we’d argue, of all modern bicycle infrastructure — is to let Isabella go where she wants. Not every bike project will be able to serve Isabella. Some streets are just too narrow. Some budgets are just too thin. But if any new bike project isn’t good enough for Isabella, we would argue that it should have a pretty clear reason why not. As Green Lane Project Director Martha Roskowski wrote in January, it’s time to stop building black diamond bike lanes. Painted stripes and shared lanes simply don’t serve most people. They certainly don’t serve Isabella. If we want bicycle infrastructure to stop being seen as a handout to an interest group and start being a benefit to the public at large, we need to focus on making everything we build serve the public at large. We need to build it for Isabella. If we do, we’ll all love the cities we create. Don’t be silly, what Isabella really needs is a 2015 Mustang. Is she a sissy? 1) Too much traffic during the times of day when utility cycling is most useful. This isn’t a problem because I can’t deal with traffic. I can. It’s a problem because it makes cycling slow, inefficient, and more stressful (both physically and mentally) than it inherently needs to be. Unlike recreational cycling where I can pick hours when the streets are much less stressful, I would need to ride when things are actually open in order to benefit from utility cycling. 2) Few safe places to park a bike. Even assuming #1 wasn’t an issue at all, you’re not going to get very many people using bikes if they have no place to store them. People want their bikes to be there-whole, when they’re ready to hit the road again. Parking is moot for recreational cycling but integral to utility cycling. 3) Issues with law enforcement (maybe this is mostly unique to NYC but it’s worth mentioning). As cycling has grown in recent years, this growth has been accompanied by increased police attention even to harmless but technical violations of traffic laws by cyclists. In general the levels of enforcement are highest during the times and places where utility cycling might be most useful. This often gives utility cyclists a choice of risking a ticket, or following the letter of the law on infrastructure which is somewhat often really suboptimal for biking. In a way this kind of ties in with #1, but it’s worth mentioning separately. Good bike infrastructure would make motor traffic congestion/traffic controls moot as it would bypass most of this. A sane society would also have less restrictive rules for cyclists when operating on mixed roads, such as Idaho stops/yields. In the final analysis, I might say if a new bike project isn’t good enough for Isabella, then it probably isn’t good enough for Joe, either. Most of the things which would benefit a young rider, like safe routes with minimal motor traffic conflicts/crossings/stops, ample bike parking, and highly discretionary enforcement of traffic rules on cyclists, would also benefit me. I think this is spot on. Having always been an enthused and confident cyclist, my habits have changed considerably once I started biking with my kids. And my definition of a good bike lane is if I will let my kids use it. Problem is many are not. Good bike lanes often stop and completely disappear before you get to your destination, and I know a lot of people that only bike with their kids in parks. They wouldn’t think of letting their kids bike on the same streets that they ride on, so they drive to the park. Making sure that our kids can and are biking on our streets is the best way to make sure that biking evolves from ‘something that kids do in a park’, to ‘how kids get from A to B’. I’m going to keep on repeating this until the Green Lane Project gets it. Unfortunately what I see often held up on this blog via People for Bikes’ Green Lane Project fails this test miserably. Most examples are good for Isabella only! This is a real shame too as there are plenty of good examples out there that truly serve everyone. Far and away the best and most proven example the Green Lane Project has somehow never cited is Davis California. With bicycle lanes and pathways planed and designed by old-school, EXPERIENCED cyclists, Davis has the nation’s highest bicycle mode share at around 25% and none of its students are bused to school. And even though much of Davis’ infra is simply paint on a road, I would never call it “black diamond” bike infra. Also, much could be achieved if American drivers weren’t allowed to behave like homicidal maniacs. I just spent a month living in Hailey Idaho where the drivers were patient, tolerant and actually drove the 25 and 20 mph speed limits (there were none higher in the city limits). Even though there was no other bike infra in town besides a single rail-trail and one road with a conventional bike lane, kids (along with plenty of “non-cyclist” adults) could be seen riding there bikes all over town, many even without helmets! This may work very well from a campaigning/message standpoint. It’s simple and short and sort of gets the point across. In the real world I have two concerns. First, bikeways also need to be designed for those who want to ride 15 – 20 mph and they need to be designed for disabled folk on mobility scooters and so that all of these different people can safely co-exist. Second, why is Isabella 12 and not 7 or 8? Do we not believe that our 8-year-olds are as capable as an 8-year-old in The Netherlands? Every aspect needs to be designed so that 8-year-olds can safely use them. Much of this is in de-complicating everything. 8-year-olds and 80-year-olds (and sometimes 50-year-olds) need things to be exceptionally simple. The Dutch have largely achieved this. Paths are easy to follow and right-of-way is consistently clear with sharks teeth. The Dutch have what is likely the best in class bicycle network. We can campaign for Isabella, but we need to build according to the highest standards in the Dutch CROW manual for bicycle design. If it’s built properly for Isabella, why does she need a helmet? Because kids run into things, regardless of whether cars run into them. Not really. If that were the case then there should be massive numbers of head injuries in The Netherlands. Their rate of head injuries of children under 16 is actually lower than ours and this is with nearly every child riding their bicycle to school by themselves without a helmet. (sigh). Maybe Isabella wants to wear a helmet? 🙂 They can be quite fashionable. This is my first time hearing the term “black diamond” bike infrastructure and I already hate it. When I started bike commuting, there were very few bike lanes in my city and most of them were not on my route, so I took as many wide residential streets with 4-way stops or lights as possible. I am definitely not one of the 1%, and I would not, now or then, consider that “black diamond” biking. “Black diamond” biking was the busy and/or narrow streets, or the sidewalks that pedestrians actually use. Terrifying and dangerous. Over time, they’ve built lots of paint on pavement lanes, with and without buffers. Each one was an amazing improvement for the people already biking. Our local bike group tracked the effect of the lanes – they were enough to get more people biking and using safer behaviors, in turn building support for more and better bike infrastructure. To say that painted lanes are “black diamond” bike infrastructure and not worthy of being built is just mind-blowingly arrogant and ignorant. Bike lanes are safe! Bike lanes get more people riding! Bike lanes are also the easiest way for a city to start, since it takes less money and political will than fancier infrastructure. The idea behind this seems to be that individual bikers can’t start on bike lanes that are even a little hard or scary, but that cities can start with the hardest infrastructure. That completely ignores that each individual increment to more infrastructure and safer infrastructure grabs a slightly larger slice of the pie while still being politically palatable. Because you cannot count on other users, vehicular or otherwise, to not make a mistake. An ounce of prevention is worth a pound of cure. If it’s built properly for Isabella, those other users are much less of a danger. That is why children in The Netherlands don’t wear helmets and don’t need to wear helmets. Of our 700 bicycle fatalities each year, how many would have been prevented by every single one wearing a helmet? Based on statistics in the U.S., Netherlands, Australia, and Canada, zero. Head injuries as a percent of all bicycle injuries are about 32-35% in all of these countries and appear to have remained the same before and after mandatory helmet legislation. On the other hand, we can be fairly assured that proper infrastructure will save lives. 1. Because many states in the USA require cycle helmets for children. MD (16 and under) DC (15 and under) and VA (14 and under) all require helmets below a specified age. 2. To avoid the distraction of the emotional logic folks, who only believe what feels right to them. Study after study fails to find an effect (and those that claim to do so are debunked), but the bicycle community seems not to be ready to face the endless supply of emotionally-wrenching anecdotes that the helmet believers seem to have at their disposal. (If only everyone who had a similar anecdote about a car would speak up, we could all switch to biking/walking/transit tomorrow). I’m a big fan of actual logic, but I have a lot of respect for the power of emotional logic. 3. FWIW, here’s the emotional-logic response to your question: because we haven’t built it for Isabella yet. This is brilliant! Isabella is much less abstract than “8 to 80.” My limited experience is that it goes over well on twitter. We settled on a 12 year old because we wanted her to be able to set out with friends for the park on their own, without a parent. We wanted to have her ready to explore her everyday world by bike. It’s somewhere around 12 when U.S. parents are comfortable with that (varies widely depending on the parent, neighborhood, etc of course). Kids are generally able to ride competently at 8, but most parents aren’t ready for them to ride alone at that age. She’s just intended as a personification of the 8 to 80 set, a design user of the all ages & abilities networks we need to build. Thanks for the comments, they’re helpful as we further refine Isabella and figure out how she’ll be most useful. Ideally, there should be a connected network of low-stress bicycling facilities. Realistically, in big U.S. cities, there is not enough space due to heavy traffic and money to do this. That traffic is due to people driving instead of riding. If we wait until everyone rides, our work will be done for us and we won’t need infra. But what if Isabella wants to go to the Hot Topic store that’s on a busy street? And then to the library that’s on another busy street? People riding bicycles want to go to the stores and cafe’s that are often on busy stroads. For the other 98% of the population, if there is not a safe bicycle facility to where they want to go, they’ll not ride a bicycle, but drive and create more congestion. 700 deaths seems like a lot for a population of 17M. How are people in the Netherlands being killed on their bikes? One of the co-authors of the Low Stress Bicycling and Network Connectivity research report, that I provide a link to above, is Peter Furth, a professor of civil engineering who lives in Boston. He was frustrated by the lack of willingness of the government of Boston to connect two bike paths together. Instead of waiting an eternity to make a complete route of low-stress bicycling networks, he came up with using inherently low-stress residential streets as a way to quickly make a low-stress network and small segments of major streets that are usually very difficult to obtain. Instead of waiting for decades for the situation to change, he came up with an alternative to get much more people bicycling within a short amount of time. His target user was adults. Creating a complete route that has a stress level low enough for children to use would be much more difficult when you start with a low mode share for bicycling. Hi Martha, thanks for your reply. I understand where you’re coming from, but there are a few dichotomies. First, you’re saying that many parents won’t want kids younger than 12 going off by themselves, yet you include a helmet that says that even after it’s built for Isabella it will be so dangerous that a helmet is recommended? Many parents may be more afraid of something that requires a helmet than the risk of their child being abducted (or whatever else might befall them going out alone younger than 12). We are big fans of Peter Furth’s work and are currently working with him to implement his low-stress analysis in Boulder and Memphis. A good network for Isabella will include side streets with slow speeds and low-volumes of cars, separated pathways like rail trails, and protected bike lanes on bigger streets, with safe crossings everywhere. 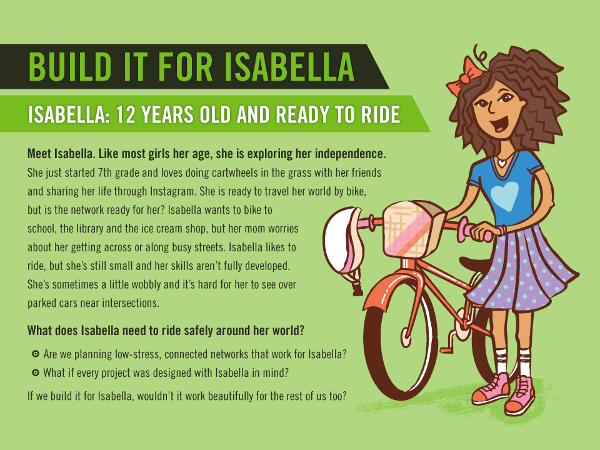 Our tagline says “Build it for Isabella” which does not imply that the network is already in place. We included a helmet in her basket as an acknowledgement that most parents in the U.S. insist that their kids wear helmets. Debates over helmets take up a lot of energy, and a lot of people are already having robust discussions on the topic, so we have chosen not to. We’d rather put our energy into building safe networks for Isabella. On a per km ridden basis they actually have about 1/9 as many fatalities as we do. Of those fatalities a significant number are elderly (NL have a much higher percentage of elderly riders than any other country) and some of these are simply heart attacks that happen to happen while riding. I think blunt force trauma to the abdomen is the highest cause. Check out the original linked article, which doesn’t label all painted lanes as “black diamond,” but just uses the term to describe gnarly riding in traffic. Isabella also needs safe parking, and law enforcement that cares about bike theft, so her bike is still there when she gets back. I’m not sure what you’re referring to in terms of lanes that are only usable for 12 year olds. The various protected bike lanes I have ridden in had plenty of space such that I was easily able to pass slower riders (and be passed by faster riders). The only times I have had to go more slowly than in a paint-only lane is something like SF’s Market Street, which is due to the sheer volume of riders rather than the physical design. That’s a pretty good problem to have. Davis is a great place to ride – it’s also a rational grid pattern with plenty of parallel low-traffic neighborhood streets. Many cities don’t have that pattern, offering no alternatives to busy arterials. I read Martha Roskowsk’s original Jan. 2014 blog article, and while I agree with the main point of her opinion in that piece, she makes no clarification that not all bike lanes are Black Diamond infra. I’m sorry but as a director of a program, you got to pick your words really carefully. I don’t find it surprising that her opinion generated nearly 150 angry replies which all focused in on her equivocation of bike lanes to black diamond infra. It’s not just space to pass slower riders but a design that is safe for a cyclist to operate at modestly high speeds (15 to 20 mph). I would not feel safe riding over 12mph on most of the protected bike lanes the Green Lane Project has held up as model examples for the nation to follow. And some of the projects the GLP has held up to the national spotlight could have easily been solved with conventional bike lanes as traffic on those roads was low to non-existent. As for Davis, outside of downtown it is built out on the typical 1 mile grid system found in many Western towns. The difference is that Davis has been smart to plan its city over the past 50 years for bikes, peds and cars equally which is why it works so well on a bike (or on foot). It also has modern protected bike infra that the GLP would be smart to go gaga over. These protected lanes are superior in design and are very useful for cyclists regardless of age and/or ABILITY. I loved using them when I visited. BTW, the SFMTA does great work. That their protected bike infra has congestion is a testament to their great designs. My issue is not with protected bike infra but with the GLP as it seems to be consistent in citing pretty bad examples. That the “national leaders” working at the GLP are not sophisticated enough to see the design flaws with the examples they cite leaves me shaking my head. Reading it again, she does sort of imply that the size and business of the street is part of the problem, but she still points the finger at the infrastructure type and not the street selection, which is a much more reasonable critique. I really hate it when people are down on painted lanes like that because they are amazing improvements over nothing, which is what many place still have. They are safe, and they allow networks to be built very rapidly with minimum expense, which is key to building ridership. To continue the analogy, a lot more people will try a ride that is all “blue” painted lanes than one that is part “green” infrastructure and part “black diamond” gnarliness. Head/Brain injuries as a percent of all bicycle injuries are the same in The Netherlands (32% of all injuries) with zero helmet use as in the U.S. (33%) with moderately high helmet use. It also appears to be about 33-36% in Australia, Canada, Denmark, and elsewhere. In the real world, helmets do not seem to make any difference in reducing brain injuries. They are nothing more than a fashion statement. However, helmets and the promotion of the need to wear helmets very likely reduces average peoples desire to ride bicycles and to purchase new bicycles and accessories. This due both to not wanting their hair to get messed up (and not wanting to be like the sweaty cyclists with stinky helmets we all try to avoid in cafe’s) and because it makes bicycling seem dangerous (subliminally or more directly). If I did not believe this issue important I would not bring it up. I think your Isabella concept is really great and can be very useful and successful. I think that the helmet is problematic for your goals (and the goals of your manufacturers other than those who make helmets). By including the helmet you’re making a statement, by leaving it out you leave that statement up to others. Cadys, painted bike lanes may not be black diamond for you or for me, but they are for the majority of average people. A painted bike lane will increase bicycling (at least along that route because some of the increase is usually people switching from other routes), but only by a percent or two. If we want to see 10% or 30% of people riding bicycles we need good segregated Dutch style infrastructure. Oy vey. The Isabella concept is not “promoting” helmet use. Re-read Jonathan Krall’s comment above. That’s not how trail designations work though. A trail is what it is. While I have respect for the courage, confidence, and skill it takes new skiers and riders to attempt and conquer greens and blues, it doesn’t make them black diamonds. On the plus side. you are mistaken about the increase that can be expected with painted lanes. I don’t know about NYC, but in Philly our Bike Coalition does a lot of work to track bike ridership. From 2005 to 2013, we saw a 260% increase in bike ridership. That’s a 30% increase per year for eight years, with only painted bike lanes. Some are painted green, some have painted buffers, but nothing other than paint has been put down in the entire city. We also have one of the highest bicycle mode shares in the country at 2.3%, more than 3x New York’s. If anything, you’ve convinced me that a very small proportion of painted bike lanes could be considered “black diamond”, in select places like NYC and DC that have abnormally high and extremely poorly behaved traffic. Tragically, commentators in NYC and DC are taking this to mean that painted bike are bad in and of themselves, when it’s really their streets and their traffic that’s making them bad. You couldn’t pay me to drive in Manhattan – but that doesn’t mean surface streets are “black diamond”, it just means that driving on surface streets in Manhattan is. Take the guy in your video – he raised some valid points about other people’s bad behavior, and both the women and cabbie are clearly in the wrong – but he was also being a giant tool about it. He was mad that he couldn’t go 25mph in the bike lane. Nobody, absolutely nobody, in that video was gonna go 25mph. He couldn’t have done it in traffic, he couldn’t have done it lane splitting, and he couldn’t safely do it in the bike lane. Even if there was perfect Dutch-style infrastructure he wouldn’t be able to do it because then there would be more and slower cyclists. Not to mention all those pedestrians. The bike lane is not the problem here, 8 million people going to work on the same island is the problem. And wanting to be special and go faster than everyone else rather just being smart and biking defensively. That’s not a ‘black diamond’ skill, that’s common sense. I appreciate the shout-out, but my position isn’t that I disagree with Opafiets, it is instead that we should focus on one fight at a time. I would dearly love for the leaders of the bicycling community in the USA to launch an anti-helmet-promotion campaign aimed at the bicycling community. I regard implicit and explicit helmet promotion, by the bicycling community, as having and extremely negative impact on bicycling in the USA. I feel like we are trying to run forward while dragging the heavy weight of bicycle-fear that helmets represent to the public and the heavy weight of emotional baggage that helmets represent to the bicycling community. Or, to use another analogy, we are trying to get our important work done via bicycle, while juggling a helmet along with all of the actual useful items we need to carry with us. It just keeps getting in the way. Nevertheless, I hope we all get behind Isabella as we work with the public. Maybe someday the bicycling community will develop the cajones to take on the bicycling community with regard to those useless styrofoam hats. In the mean time, let’s please get on with our work.